Beauty Bungalow Microdermabrasion | The next best thing for your face! Buffing away the top layer of skin is the most popular technique in skincare! From day spas to dermatology clinics, microdermabrasion is one of the most popular treatments because it works. Plain and simple. There are two forms of professional microdermabrasion: crystal and non-crystal (using a diamond tip wand.) We use Clear Fx medical-grade microdermabrasion technology which is the best equipment on the market and is capable of performing both crystal powder and diamond tip. 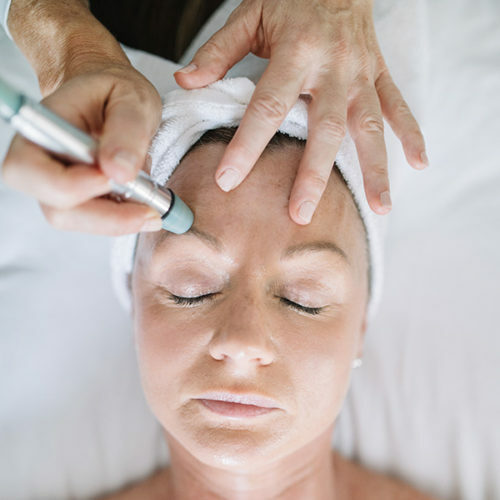 This completely pain-free procedure gently polishes away the outermost layer of dead skin leaving skin feeling soft and healthy, then suctions the skin, “like a vacuum for your pores” to pull away debris trapped under the skin. It also creates the ideal cellular environment for better product absorption, allowing antioxidants and active ingredients to penetrate deeper into the skin for better results. The professional skin treatment that promises clearer, healthier, radiant skin in virtually next to no time at all. Microdermabrasion helps to brighten hyperpigmentation sun damage. Microdermabrasion banishes post-acne dark spots. Microdermabrasion softens rough, textured skin. Microdermabrasion stimulates cell turnover for younger looking skin. Microdermabrasion reduces the appearance of fine lines.